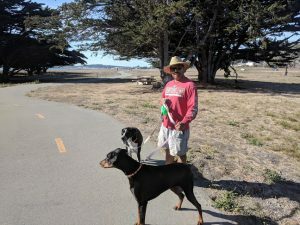 The San Mateo County Parks Department, with the help of a Dog Management Committee, is updating its policies regarding dogs in parks. Currently, the county ordinance prohibits dogs in County Parks. However, the County has acquired parklands over the years where dog use was allowed and therefore grandfathered in. Since the current ordinance was inconsistent, the Board of Supervisors recently amended the ordinance to reflect that dogs are allowed in park areas that have been specifically designated and signed. Here are the dog-friendly parks and trails where you can take your leashed dog today. Please note that some of these areas reflect a portion of the park. For example, in the case of Fitzgerald Marine Reserve, dogs are not allowed down by the tide pools. 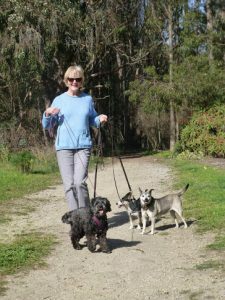 The Jean Lauer Trail at Pillar Point Bluff offers dog-walkers a chance to take in the breathtaking sights and sounds of the Pacific Ocean. The 220-acre bluff top includes a section of the California Coastal Trail and offers views of Pillar Point Harbor, agricultural lands and the world famous Mavericks surf break. While dogs are allowed on the bluff, they are not allowed on the beach. 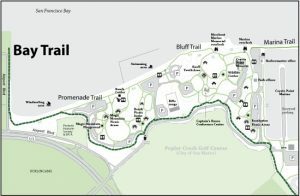 For a longer, scenic walk with a dog, one can walk from Pillar Point Bluff to the bluff at Fitzgerald Marine Reserve. A segment of the California Coastal Trail connects Cypress Avenue to California Avenue under the shelter of the Cypress grove. Dogs are not allowed by the tide pools. This is a marine protected area and harbor seals seek this habitat as a refuge for birthing and raising their young. 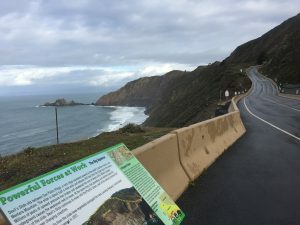 Devil’s Slide, originally a section of Highway 1, is now a multi-use paved trail. It is also part of the California Coastal Trail and for 1.3 miles one has gorgeous views of the Pacific Ocean and an up close look at coastal erosion geology. Bring your dog and enjoy a leisurely walk, look for seabirds and give thanks for access to trails such as this one. 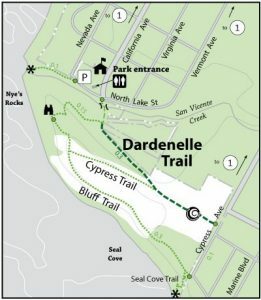 Dogs are only allowed on the Bay Trail in Coyote Point. The Bay Trail runs along the Bay, through many Peninsula cities, but curves inward at Coyote Point. It offers miles of paved trail for walkers, joggers and dog-walkers. Quarry Park is very popular with dog walkers. Dogs are allowed on the trails, but are not allowed in the playground area. Quarry Park is tucked away on the coast and offers pleasant surprises for a first-time visitor such as a labyrinth that sits at the bottom of the abandoned quarry. The park offers spectacular views and some good hills for those who like a more challenging hike. Just south of Surfers Beach is Mirada Surf which is part of the California Coastal Trail and offers excellent views of the ocean, harbor and hills to the east. Dogs on leash and their humans are welcome to stroll this bluff and take in the ocean breeze and lovely sunsets. Amending the County ordinance is a first step of several which includes a six-month period of community education, followed by enforcing the ordinance with fines for non-compliance. 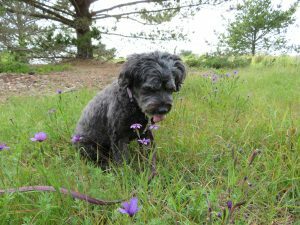 San Mateo County Parks will then look at additional areas for dog access including possibly adding some off-leash areas. 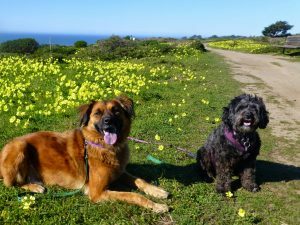 dog-friendly, Dogs, dogs in parks, parks, san mateo county, San Mateo County Parks, san mateo county parks foundation, trails. Bookmark.